I don’t know about you, but Christmas is the time of year when there is nothing better but curling up warm and reading ghost stories. We have a tradition in our house of watching the Amicus compendium horror films written by Milton Sabotsky and directed by Freddie Francis starting with Tales from the Crypt (1972) – well, it’s practically a Christmas movie judging by the Joan Collins story. However, great as they are Milton Sobotsky’s brand of compendium won’t do for this kind of blog post as none of the stories are based on real-life crimes – at least I hope they aren’t. So to keep in the spirit of my intermittent series of real-life crimes behind famous films I’m going back to the compendium film that started the sub-genre – the 1945 film Dead of Night. A rare example of horror from the first half of the 20th century, Dead of Night is about a group of strangers who find themselves together in a country house. One of the group, architect Walter Craig confesses that he has had a recurring dream of them all gathered together and the group start telling the stories of their own brushes with the supernatural. Now for the purposes of this blog post, I’m not interested in the most famous segments, including the ventriloquist’s dummy story with Michael Redgrave which scares me to this day. The section I’m interested in is the actual Christmas ghost story that makes up the second segment. This story is linked to a very famous real-life crime and that’s what I’m going to look at in this post. The murder of little Francis Saville Kent at his father’s house in Road in Wiltshire was a sensation in its day. The gruesomeness of the crime – the child was found stuffed down the privy with his throat cut – the middle-class status of the family, and the succession of suspects with a sensational reveal of a teenage killer after many years guaranteed column inches at the time and it was a case that stuck in the memory. We don’t know why writer Angus McPhail picked the case for his Dead of Night segment. McPhail was a frequent scriptwriter for Ealing films and also worked with Alfred Hitchcock on Spellbound (also 1945) and The Wrong Man (1956) as well as the classic Whisky Galore! (1949). His segment Christmas Party involves a little boy who is afraid of his older sister because she wants to kill him. There is no doubt whatsoever that the Road murder is being referenced as there are name checks and a lot of biographical details are given. The fact that it’s a real murder though is completely incidental, it just gives an extra dimension to the horror and this may well have been the intention in including the details. The Road murder has been well explored in recent times thanks to Kate Summerscale’s incredibly successful The Suspicions of Mr Whicher (2009) so I won’t go into too much detail about the ins and outs of the case. 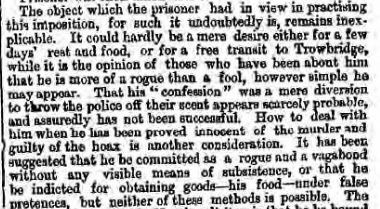 On Sunday 8th July 1860 Lloyds Weekly Newspaper quoted the Bath Chronicle to give its readers’ the terrible details of the case. They were baffled by the mystery. It wasn’t long before a suspect emerged. Inspector Jonathan Whicher, who had been investigating the case was convinced from fairly early on that the murder had been committed by Saville’s half-sister Constance. 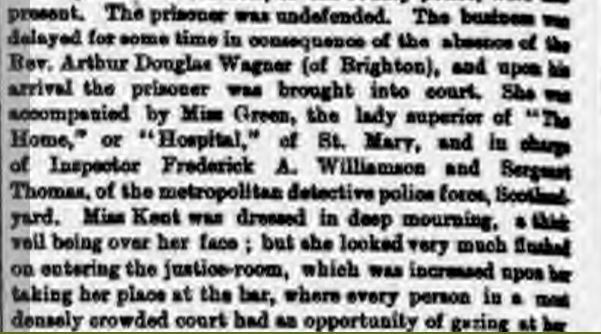 On Monday July 23rd 1860 The Standard reported on Constance’s appearances in court with Inspector Whicher setting out the case against her. The London Evening Standard, Monday July 23rd. But Whicher’s suspicions against Constance proved difficult to prove. Then someone else confessed to the crime. On Thursday, August 16th the London Daily News reported on the court appearance of a John Edmond Gagg who claimed he had killed the child. However, it soon became apparent that Gagg had not even been in the vicinity at the time of the murder and could not have committed the murder. The Daily News was not impressed. 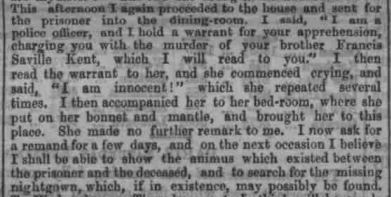 London Daily News August 16th 1860Constance finally confessed to the murder in 1865. The London Daily News carried the story as did many other papers. The Road Hill House murder had certainly captured the public imagination. The story of little Francis Saville Kent and his sister Constance still has a draw today and I would recommend a read of The Suspicions of Mr Whicher for the full details. But for a Christmas ghost story take a look at Dead of Night – be scared by the ventriloquist’s dummy but remember the sad, sordid tale behind that innocuously creepy Christmas party segment. All newspaper snippets copyright The British Newspaper Archive.